We talk all the time about the power of mala beads—how they aid in mindfulness, ease meditation and increase your general sense of well-being. And a lot of that comes not just from the mala beads themselves, but from the holistic properties and energies that reside within each of the semi-precious gemstones we use to handcraft our malas. That’s because these gemstones are cut from raw crystals—sacred minerals that have long been known for their powerful healing abilities. While there are a nearly endless amount of crystals out there that we love and use in our collections, there are four in particular that we try to surround ourselves with in order to call love, strength, serenity and clarity into our lives. Featuring the Rose Quartz Mala Necklace + Rose Quartz Om Charm Bracelet. Rose Quartz is a crystal of unconditional love that enhances compassion, peace, tenderness and comfort. Known as the "Heart Stone,” it helps you heal emotional wounds and resentments, allowing you to give and receive love from others. It also encourages you to practice self-love and self-care. This feminine crystal attracts love, deepens your bond with friends and family, and helps you see the beauty in nature and all beings. As a nurturing stone, rose quartz is calming, reassuring and helps you find personal fulfillment. It also strengthens your sense of empathy and helps you accept necessary change. To foster a sense of deep love for yourself, try starting each day by holding a rose quartz stone or crystal in your dominant hand. Take a few deep breaths, then say a self-love affirmation of your choice out loud (we like something such as “I choose love,” or “I deserve my own love.”). Say it as many times as necessary to fully believe the words. Featuring the Smoky Quartz Tassel Bracelet + Smoky Quartz Om Charm Bracelet. Smoky Quartz is a grounding and uplifting stone that provides protection, balance and a sense of confidence. It relieves tension, stress and anxiety, while eliminating worry and negative thinking. Known as the “Stone of Power,” smoky quartz gives you the strength and bravery needed to make positive changes and manifest your dreams. It also has powerful cleansing and detoxifying properties, and boosts your feelings of security and stability. To relieve anxiety or tension, simply hold a smoky quartz crystal or mala in your hand, breathing deeply until you feel your stress melt away. Carry it with you throughout the day to help you absorb less negative energy from people and situations surrounding you. You can also try sleeping with a smoky quartz stone at the foot of your bed to help draw out tension and stress while you rest. Featuring the Amethyst Loose Knot Mala Necklace + Amethyst Mini Tassel Bracelet. Amethyst is a spiritual stone that stills the mind, provides a sense of serenity and eases you into a meditative state. Derived from the Greek word ametusthos—which means “not intoxicated”—amethyst prevents overindulgence and removes destructive thoughts. It helps you remain clear and centered, while dispelling negative energy and enhancing wisdom and understanding. As a supportive stone, it also brings emotional balance and assists in stronger decision-making. Amethyst aligns with the Crown Chakra and represents consciousness, bringing you a greater sense of enlightenment, mindfulness and spirituality. Try using an amethyst stone or crystal during chakra meditation to open your Crown Chakra, reach a higher state of consciousness and even boost your psychic abilities. Large amethyst clusters are especially ideal for meditation, and can be placed in your meditation space to keep the mind centered, calm and focused. 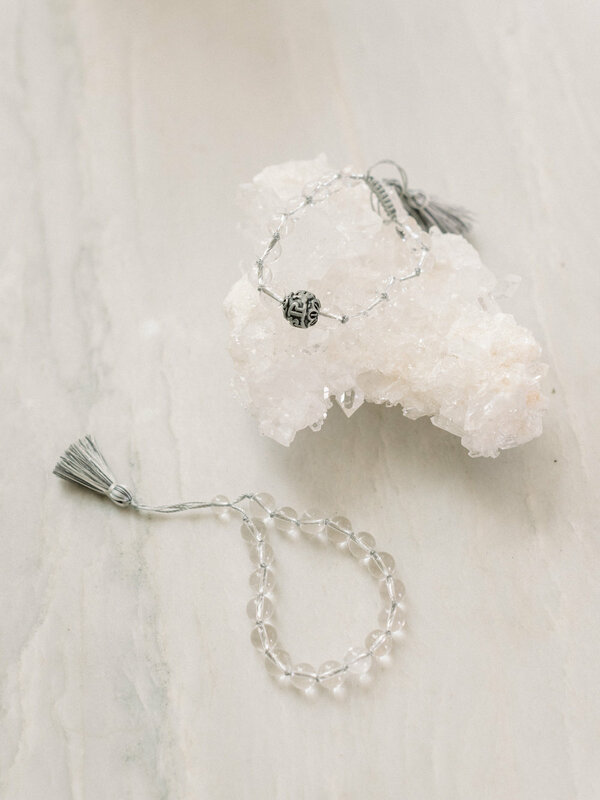 Featuring our Crystal Quartz Double Tassel Bracelet + Crystal Quartz Mini Tassel Bracelet. Crystal Quartz is a purifying stone that removes negative energy, fights emotional exhaustion and increases your motivation. It aids in concentration, unlocks memories and promotes clear thinking. As a master healing stone, it lifts your spirits, enhances your optimism, and increases your physical and emotional energy levels. This versatile crystal also amplifies the energy of other crystals, so keeping it around your crystal collection will help boost their healing properties further. Crystal quartz is known for its ability to provide clarity, which makes it the perfect crystal to surround yourself with when setting new intentions or reflecting on your current ones. Find a quiet, relaxed space to sit down with your journal and crystal quartz stone, then write down your intentions and revisit them often.